On May 23, the U.S. Air Force Weapons School conducted its Mobility Forces Exercise, or MAFEX, at Nellis Air Force Base, Nevada. 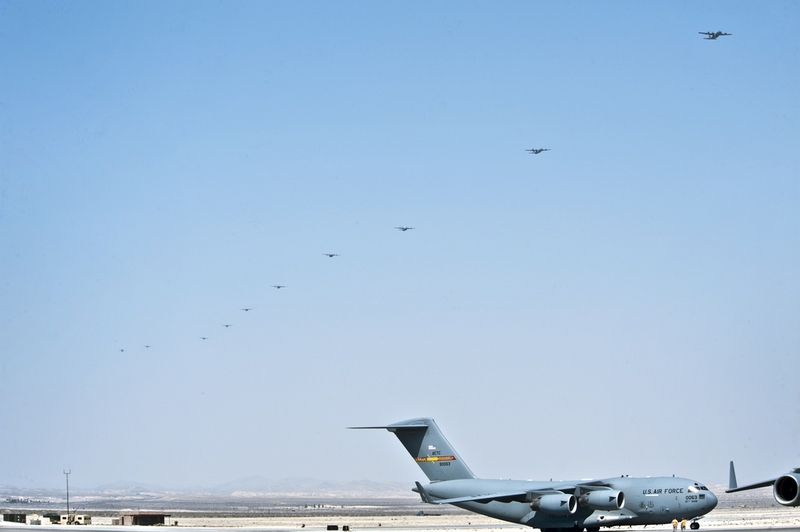 Nearly 70 aircraft, primarily consisting of C-17 Globemaster III and C-130 Hercules aircraft, operated in the Nevada Test and Training Range simulating a “forced entry” operation. In the scenario, U.S. forces had to pentrate a defended enemy country to put troops on the ground through combined airdrops of 100 paratroops and supporting equipment and landings on unprepared landing strip. Part of the six-month Weapons Instructor Course, the exercise included units from multiple services from bases around the world, syncronized to arrive on the Nevada range in an orchestrated, combined force, as the following image shows.